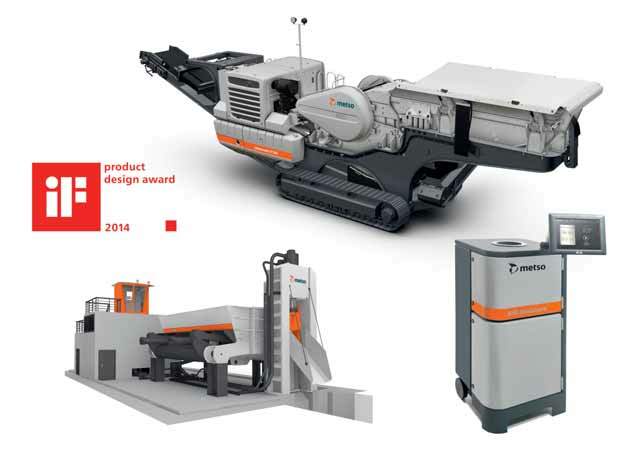 Metso’s mobile crushing plant, biomass moisture analyser and scrap shear and shredder concept have received prestigious iF design 2014 awards. The jury in one of the world’s top product design competitions recognized Metso’s products for their design quality, degree of innovation, environmental impact, functionality, safety and branding, among others. This year’s iF design competition had over 3,200 entries in 17 categories to showcase outstanding achievements in product design. The awards were presented in Munich, Germany, on 28 February 2014. In Metso, customer expectations and wishes guide product concept development process. The goal is to always provide the best possible user experience. Well-designed equipment provides product users with significant benefits. Ultimately, product design helps fulfill the customers’ needs, makes their jobs easier and sets new standards in environmental efficiency. For Metso, industrial design is a synonym for high performance, productivity, safety, usability and competitiveness. The Metso Lokotrack LT106 mobile crushing plant is designed for crushing of hard rock and recycled materials for various purposes such as infrastructure construction. The design sets it apart from the competitors not just by its look, but also by the usability, serviceability and safer working environment it offers. During the past 30 years, more than 6,000 track-mounted Lokotrack units have been delivered to sites around the world. Lokotrack was also one of the award winners in the Fennia Prize design competition this year. The Metso MR Moisture biomass moisture analyser is the first industrial moisture measurement application utilizing the magnetic resonance phenomenon. The design features competitive and easy-to-use fuel moisture measuring equipment coupled with a user interface that can be used in multiple surroundings. Metso’s EtaCut II scrap shear for crushing heavy mixed and demolition scrap, and the EtaShred ZZ shredder are both based on a globally applicable operating concept and product structure offering increased processing flexibility and low specific power consumption. The concept, which features a re-engineered design and an innovative control interface, was developed together with the German Institute for Integrated Design. With a 60-year history, the iF design award is regarded as one of the most important product design competitions worldwide. The award mirrors current trends in design and the economic benefits delivered by well-designed products. Metso is a leading process performance provider, with customers in the mining, construction, and oil & gas industries. Its focus is on the continuous development of intelligent solutions that improve sustainability and profitability. Metso employs around 16,000 professionals in 50 countries.